The rustic style decor is comfortable, cozy, simple and strives towards nature. Rustic decor recalls the atmosphere of an old cottage in the countryside. Usually choose it people, who like life comfortable and close to nature. We have collected a list of 10 of the best DIY projects to give your home that rustic look. Whatever your dream for a rustic look, you are sure to find something in this collection. Many of these projects are so easy to do and you can complete them in less than a day. 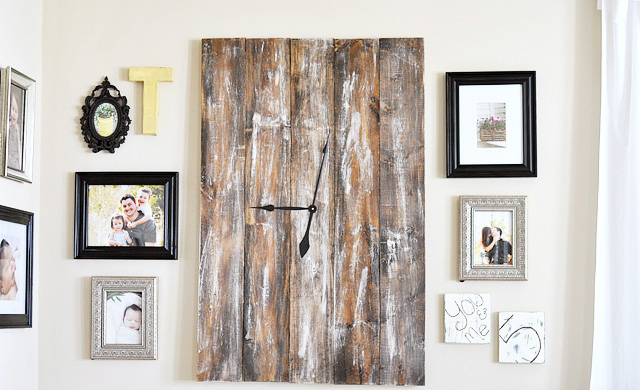 With just a few piece of scrap boards, paint, and stain, you can learn how to make this over-sized weathered clock! A great statement piece!